In this day and age, it’s not uncommon that data entry errors occur in data sets that are so large that looking for and correcting the errors by hand is impractical. Fortunately, Minitab includes tools that make it easy to get your data into shape, so that you can proceed to getting the answers you need. Let’s say, for example, that you were going to look at the Global Wood Density Database. It’s an exciting piece of work if you’re into wood density. Chave et al. 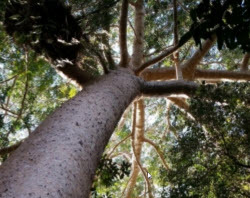 called it “the largest compilation of wood density data to date, encompassing 8412 taxa, 1683 genera, 191 families” (2009). Kindly, however, it’s provided at datadryad.org as an Excel file. As it turns out, there’s a minor error in the Region column (at least as of this writing). You’d probably hardly notice it, but there’s a case mismatch. 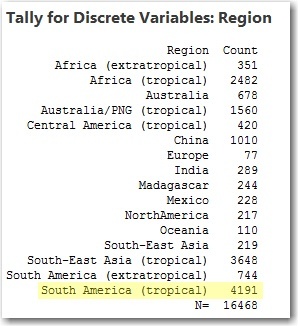 A total of 4,182 rows are given the region South America (tropical) while 9 rows of the dataset are given the region South America (Tropical). This is the kind of thing that can cause problems in your analysis. If you suspect such an error exists, or just want to verify that it doesn't, it would be a real chore to pore through 4,191 rows of data in search of mismatches. Fortunately, you could find them by doing a quick tally in Minitab. Choose Stat > Tables > Tally Individual Variables. In Variables, enter Region. Click OK. In the output table, you can spot the case mismatch at the bottom. Choose Data > Recode > To Text. In Recode values in the following columns, enter Region. In Method, select Recode individual values. In the table that appears, scroll down to find the case mismatch. 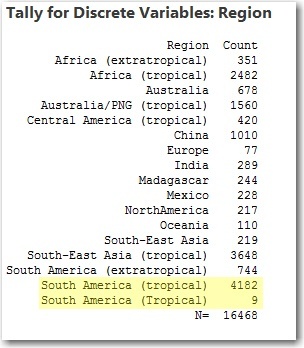 Then, in the Recoded value column, change South America (Tropical) so that it uses a lower-case t.
In Storage location for the recoded columns, select In the original columns. Click OK. The summary shows you the 9 instances that were changed. Choose File > Open and select the Excel file from your file system. Click the tab titled Data, the name of the sheet with the data in the original Excel file. Select Data has column names. In Text columns, select Correct case mismatches. Click OK twice. If you tally the Regions column now, the correction to the column is already done. To get the answers you need from your data, the data themselves have to be clean enough to analyze. Minitab provides a number of tools you can use to get your data ready faster, so that you can get on to the insights. Ready for more? Check out 3 Tips for Importing Excel Data into Minitab.